North Carolina Narrations: It Begins! I've talked about getting a few chickens for a while now. A co-worker got some a few years ago, and our neighbors at the time had show chickens. Where we were living at the time didn't seem like a great place to have chickens, though. Our yard was relatively small, not fenced, and bisected by a steep hill. Plus, we were relatively certain our landlord wouldn't be thrilled since we had to sort of talk them into guinea pigs (which somehow turned into a bunch of rats, a couple of rabbits, and three crazy dogs...which pretty much proves that we are the sort of tenants landlords have nightmares about). Then we moved to our new place last spring. We share a sprawling piece of land with a nice guy that lives in a camper out behind the big workshop between the house and a little barn. One day, he came home with a day-old calf. Momma had died during the birthing--which happens a fair bit, thanks in no small part to mankind's inability to stop fiddling with nature--so he brought it home to raise. We've been calling it Dinner. Anyway, the cow got me to thinking about chickens again. This is not as nutty as some leaps my brain takes, in my opinion, since both animals are typically denizens of the farm yard. I started doing some research into chickens and found out about heritage breeds. 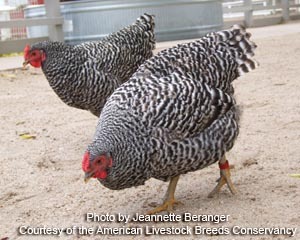 Chicken breeds that were once common but have been edged out thanks to the modern world's demand for egg or meat production at the expense of the overall health of the animal providing it. I liked some of the breeds, so I started looking at what it would take to keep a few for eggs. Yeah, there's a reason that just a generation or two ago pretty much everyone had a chicken or two or twelve. I talked to hubby about it, and was pleasantly surprised when he didn't freak out. The cow's been a good influence (or a bad influence, I guess it depends on how you feel about farm animals when you don't live on an actual farm). I started looking at chicken house designs, and for a while I was pretty excited about the chicken tractor (or ark) model. Basically, a chicken house with it's own enclosure that moves around so your chickens don't kill all your grass. Lots of different sizes and designs. Neat. Then I started looking at the cost of materials, and I wasn't completely happy with spending a couple hundred dollars minimum just to get going. I was thinking about alternatives when I saw a stack of pallets in the warehouse at work. There was a huge pile of them behind the building...sort of a landbased coral reef for weeds and critters. When I asked if I could have some (or all) of them, I got a confused shrug and, "Knock yourself out." About this time, we decided to visit a hatchery to see actual chickens. We were operating on the theory that finding out that chickens actually gave us the creeps after we had four or five of them in our yard would be bad. The place we went, Sumner-Byrd Poultry , was great! Lots and lots of different chickens of all ages, and a lot of different set-ups for housing. Best of all, we found out we kind of liked the little (and not so little) bird brains! On the way home, we started talking about a chicken house and pen again. The idea of spending money on fences (now that I had access to free wood), wasn't appealing. As we rounded the far end of our very long driveway, I saw the dog run sitting on the corner of the property and a little lightbulb went off. It was perfect. 15' x 20', fencing already in place with a door, and far enough from the house and any neighbors for comfort, and still close enough for convenience. So here we are, at the beginning. We're going to clean the dog run out, build the chicken house ('cause that'll be simple, right? ), get the chickens, and then start collecting eggs. Not lots of eggs, just a few. But I'll know where they came from, and what the chickens that laid them ate. What do you think? Have we lost our minds? Are we starting on the slippery slope to that never-never land of compounds and twelve year's worth of jam stored under the house? Or does this sound like fun? Sounds like excellent fun! I just love you calling the calf Dinner. I have to say I am already feeling a twinge of hatch envy. I look forward to watching the pallets being transformed! It's not my thing, but then I'm a lazy chick anyway. Have fun! Popping in from Write On Edge weekend linky. Show chickens? Very interesting... my first time hearing this! If I'm correct, I still remember your lovely story about the ghost on the train... you should write more fiction!